There is a building on Robson Street in Vancouver, close to Stanley Park, which attracts people’s attention because of its height. The Imperial Landmark Hotel is separated from other skyscrapers located several blocks away in the downtown business district. At 42 storeys, the hotel stands out among the smaller family houses and apartment buildings in the West End. The hotel looks like a giant screw fastened to the ground. This, along with its height, means it can serve you as a good reference point, easy to see and easy to describe. Let’s call it the screw, then. The screw is visible from all parts of the West End, from Coal Harbour and from the entrance to Stanley Park. The people living in the surrounding apartment buildings can see it from their windows. If it was not there, they’d have a view of English Bay, so not everybody may be delighted by the screw’s existence. Even though its architecture is not the most modern style, without the screw the Wesd End would be missing something important; it would be like a pot lid without the knob. The screw was built in art deco style. 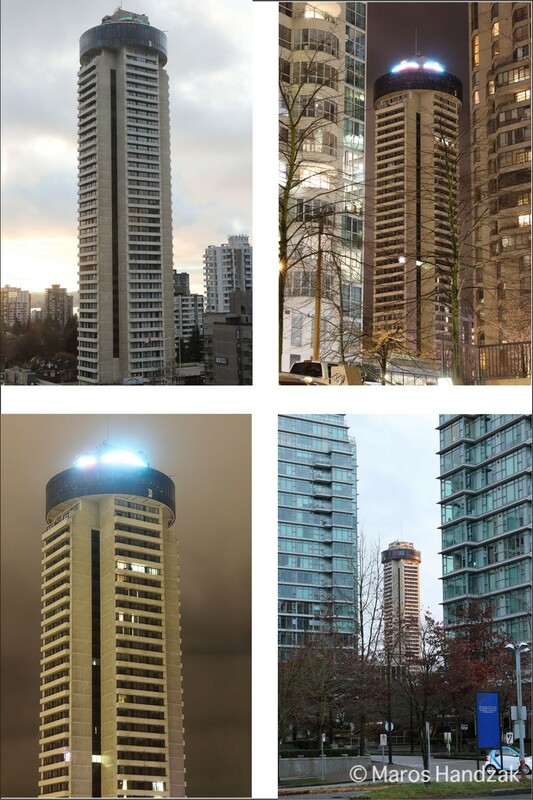 At the time it was completed, it was among the three tallest buildings in Vancouver. It reminds me of a grey-haired king who doesn’t realize his age yet, living in evaporated glory from almost 50 years ago. The screw head consists of a revolving restaurant with a city view. On its top, there is a giant logo with horizontal stripes, which illuminates the city with red and green in the dark. Thank to these lights, you are able to see the building from far and wide at night as well. Like an excellent city servant, it serves you 24 hours a day, 7 days a week— a real role model. Jock has worked as a receptionist at the hotel for almost 30 years. He is very helpful and well informed about the city, its history and architecture. He told us interesting details about the hotel and about downtown, and he also mentioned a famous Canadian architect, Arthur Erickson. We visited the places he recommended: the Roedde House Museum, right behind the hotel, the new Public Library on Georgia and Homer Streets, built in an old style, and the Museum of Anthropology, designed by Arthur Erickson. It was all worth seeing. If you want to explore Vancouver, you have to start from the screw.